Green Apple Only at GNC! Jack3d Green Apple flavor is out, and no surprise – it’s phenomenal! Phenomenal, that is, if you’re into the more sour stuff. In this article, we’ll discuss this latest flavor of the #1 selling pre workout supplement (2 years going strong!) – how the reviews are, where to buy it, and some updates on all of the other novelty flavors in case you want something sweeter. Update: Put this in WARM water and it’s like a hot apple cider drink – great for everyone in cold climates!!! Before we go any further, we must say that this is a GNC Exclusive Deal. You won’t find it anywhere else. Certain flavors can only be found at certain stores, and green apple is for GNC only. Unfortunately, the price isn’t the best, but it’s worth it for a novelty change-up. You can also wait until gold card week swings by! Click Here to go buy it now. This green apple flavor is dead on and tastes just what you expect it to – a bit like a Jolly Rancher – minus all the sugar! This is definitely tart and not for the faint of tongue – if you’re a full on sweet tooth, you might want to sit this one out. If you like sour, then I’d have to say to try it out, but Sour Cherry is even better. It goes without saying, this product is completely naturally flavored. There are also no artificial colors. This is what USPLabs does – they make a no-nonsense product that isn’t going to stain your teeth and your body, and it’s one of the reasons why they are the fastest-growing, most innovative supplement company on the planet. So just because the color isn’t a bright, vivid green, doesn’t mean it’s not going to taste good. It simply has no BS in it, and that’s good for your body AND your wallet. So let’s get an updated list of all the flavors! Grape Bubblegum – Still our favorite, and still available in any store. Tropical Fruit Punch – It’s good, but everyone is love or hate with it. Don’t expect red fruit punch – this is TROPICAL fruit punch. If you want a hint of coconut and a VERY sweet drink, go for it. Watermelon – Super sweet and super friendly, but is only sold at Vitamin Shoppe. White Blue Raspberry – Sorry green apple, but this one is still our favorite – without a doubt. It’s not super fake blue razz that looks nearly navy blue. It’s got some sourness but it’s unlike any other blue raspberry you’ve seen. Great stuff. Pineapple Strawberry – This is out but we don’t yet have a write-up about it. You can find it here at the cheapest store though. Lemon Lime – Still the original one, and still the top seller. If you’re not sure what to get, get this or Grape. Raspberry Lemonade – Totally underrated, and it lasts just long enough for you to be ready for something new by the end, but not sick of it. Sour Cherry – Only at BB.com. Great stuff. Jack3d Green Apple – Here we are! Exclusively sold at GNC. Not a ton of reviews are out there yet – it’s still pretty new. Everyone on GNC is reviewing it well, but they’re not saying much about the flavor. However, we dug our sample pack – the best thing to say is that it’s like a “light-flavored green Jolly Rancher”. And that’s a good thing – no artificial crap. Stay tuned for more reviews! As always, this is exactly the same formula of Jack3d as is in every other version. The ingredients are the same – AAKG, Beta Alanine, Creatine Monohydrate, Caffeine, 1,3 Dimethylamylamine HCl, and Schizandrol A. 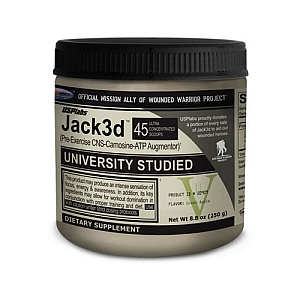 Even if you don’t like a certain flavor of Jack3d, you can still crush it quickly (in perhaps 4oz of water) and you’ll have the best workout of your life. These new flavors are novelty, and most of them are incredible and better than the original lemon-lime, but it’s still all about the INGREDIENTS – and they are uniform throughout ANY flavor! And as always, no filler crap here. Magensium, maltodextrin, artificial flavoring/colors? NONE OF THEM. This is why USP rocks. 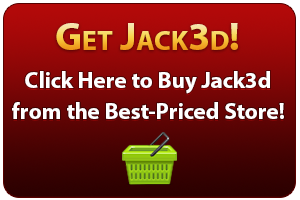 Jack3d is the number one seller for many reasons, and this is one of the strong ones.